TNR’s editorial clucking at Occupy Wall Street suffers from weak sociological imagination compounded by wrongheaded stuffiness. Stamping your foot and demanding that the world conform to your standards—cram its demands into the formula you prefer, dress as you prefer, enunciate as you prefer, curb its radicals as you prefer—before you go out to play with it may be, to use the buzzword du jour, “understandable,” but it’s neither adequate to the situation nor helpful. In fact, it’s counterproductive. You do politics in the society you have, not the society you wish you had. The rudiments of the American political condition can be summed up as follows: A bloated, short-sighted, self-dealing, revolving-door plutocracy owns a large share of one major party (partnering with the evangelical Christians located in the former Confederacy and elsewhere), and somewhat uneasily shares ownership of the other party with progressives. It finances politics and substantially determines and limits outcomes. Three decades of rampaging inequality have followed. The most recent upshot has been the financial calamity that wrecked millions of people’s lives—not only in this country—and produced an unending cascade of calamities. A president who shares the divided soul of the Democratic Party, and whose election stoked the hope that he could achieve—among other things—a substantial reversal of this trajectory, backed off short of full-throated reform, and has, moreover, especially since the midterm elections, been fought to a standstill by a ferocious backlash. 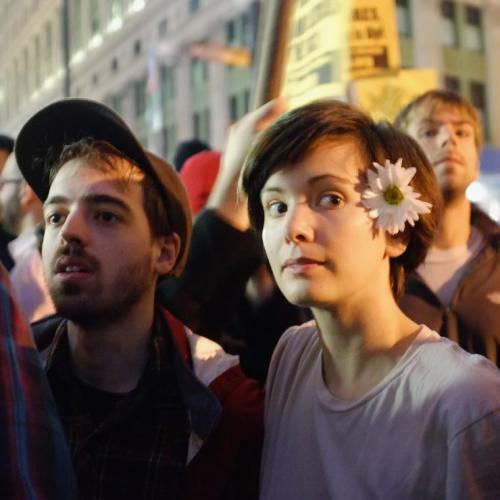 Enter Occupy Wall Street, an initiative of romantic, more or less radical—and crucially, to this moment, nonviolent—bands. Some are revolutionaries of a sort. Many are utopians. Most, in my experience, are sweet-tempered; some are not only apoplectic but apocalyptic, and some are both in succession. Hot-blooded and insouciant, their watchword might as well be: No Future. The icecaps are melting. So are reliable jobs (not that many of them would want corporate jobs in the first place). “Work within the system,” you say. Sure. Some of them worked for Obama or John Edwards in 2008, but when Obama fell into the polluted water they thought he could walk on, they had no trouble returning to everyday life—and nonvoting. They find the entire political system grotesque. They want to occupy. They don’t demand, they encamp, in community. Some are enraptured by comic theorists like Slavoj Zizek or not so comic ones like Michael Hardt and Antonio Negri. The deeper truth is that they’re in an American vein running back to the early nineteenth century—in fact, all the way back to colonization. They want to talk at length and decide everything together. So what does Occupy Wall Street “actually believe”? This is a question far easier formulated than answered. There are the placards held by the people camping in Zuccotti Park, which, as I wrote in the New York Times (Oct. 9), include such items as “End the Fed” and occasional denunciations of capitalism. There are their statements, as elicited by reporters from men-and-women-on-the-street. Then there are the increasingly numerous supporters who form, for now, an increasingly active penumbra—the outer movement, one might say. These include the thousands of union members, Moveon members, community groups, professionals, and students who made up the vast majority of those who marched on Oct. 5; and the AFL-CIO, Steelworkers and others of organized labor, who have vigorously embraced (at least verbally) the Occupy movement. There are also the citizens—some unknowable fraction of the 99 percent—who send food and donate books, equipment, and money to the Zuccotti encampment, or signal V’s and clenched fists from the upper decks of tourist buses. The bulk of this outer movement is not so actively disaffected from the entirety of the political system. But it’s angry and available. Now, movements are unruly, often chaotic, confusing, riddled with conflict, and unpredictable. That’s the nature of the beasts. They are large, they contain multitudes. (After writing this, I saw this wonderful quotation from Whitman on a placard at Zuccotti Park Oct. 13.) The larger the movement, in a society whose variety is huge and conspicuous—whose cultural life is decentralized—the more multitudinous. This poses a taxing problem for journalists—and also for liberals, who are suspicious of social movements, which do have a way of getting out of control—anyone’s control. Just what is this strange beast slouching along in such a curious fashion? Consult the text of the “Occupied Wall Street Journal,” which represents what at least some of the encampment believes. It’s romantic, excited. There are the utterances of all those encamping in Zuccotti Park, and the scores of other encampments around the country. In Tacoma, from a photo I’ve seen, they “look like” unemployed Boeing workers, not hippies, though it’s perfectly possible to be both, of course. Take the principal slogans of the big Oct. 5 march. First, the park filled up with the modal sign “Tax Financial Transactions,” printed up by the National Nurses United, a union, and by far the most common sign visible on the walk to, and into, Foley Square. By far the most common and longest, and loudest chant on the march was “We are the 99 percent.” This is not hard to decode. Translation: The vast majority has been damaged by the plutocracy and this should stop. The second most popular chant was “Banks Got Bailed Out, We Got Sold Out.” This one lacks the care of a John Judis column, let alone a treatise on modern political economy, and would benefit from a reading of both, but it’s not exactly illiberal. There is no single leader. True enough. The spirit of this gathering is anti-leadership. Leaderlessness poses lots of problems for movements—including the emergence of de facto but unauthorized leaders—and denouncing it comes naturally to people better suited for hierarchical structures. I harbor such impulses myself. But none of this alters the achievement of Occupy Wall Street. In a dispiriting time, they have put some new facts on the ground. This is no small thing, especially when initiatives come so substantially from the right. It’s a huge thing, in fact, in a twisted political system busy debating the shape of the earth. Now, the new facts may not last the winter: the inner movement wants to persist as an occupation (of more parks, at least), but they will soon be challenged by the elements. The outer movement, which is now arguing about how to proceed, how to channel the energy of the protests toward progressive reform, also faces difficult choices. But if mainstream liberals follow TNR’s advice to shun the utopians, that will make the radicals in the encampments more, not less, embittered. They already invoke the spectre of “co-optation,” which always haunts radicals whenever mainstream political figures make sympathetic noises. If, as H. L. Mencken said, a Puritan is someone “desperately afraid that someone, somewhere, might be having a good time,” today’s romantics live in fear that someone among the elites might agree with them—and act on their agreement. Three cheers for skepticism, then—including skepticism about liberals’ own groupthink—the liberal propensity to devolve into what Harold Rosenberg once called “the herd of independent minds.” When idiots drive John Lewis off a platform in Occupy Atlanta, condemn them for that. I do. But pure condemnation is self-defeating. The more conventionally organized had better learn how to engage Occupy Wall Street in friendly discussion. They’ve breathed life into a suffocating polity. So what does Occupy Wall Street “actually believe”? What, in other words, is its essence? A good question to ask all political phenomena: for example, what is the essence of the Democratic Party? This is a good time to find out. Todd Gitlin is a professor at Columbia, a former president of SDS, and the author, most recently, of Undying, a novel.